Our experience of social space is coded. Divisions of gender, class, and race are articulated in these codes. We read the world through this coded experience. This is the focus of Griselda Pollock's article "Modernity and the Spaces of Femininity." Read the excerpts of this article. Pollock's article explores the "modern" urban world of Paris which was in the nineteenth century transformed into a modern city. This is marked by what is known as its Haussmannisation. It is named after Baron Georges-Eugène Haussmann who was given the responsibility by Napoléon III to carry out a major urban renovation of Paris. 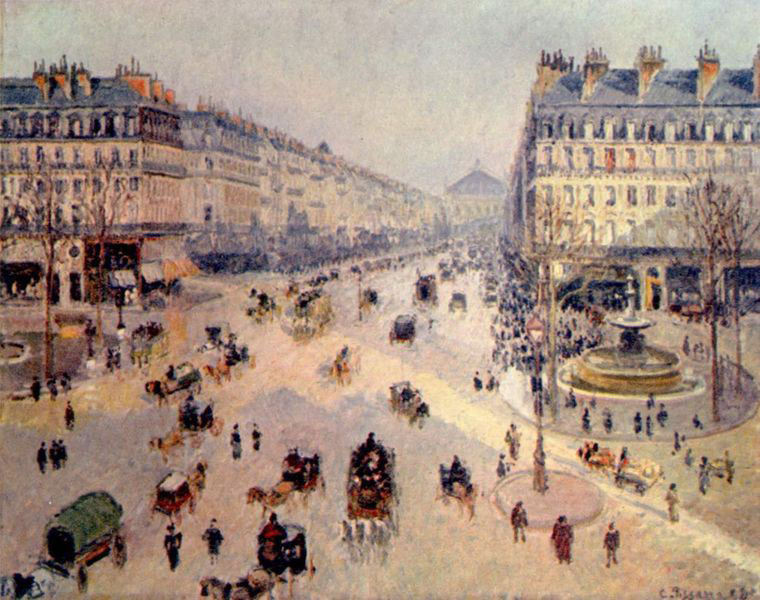 The project carried out between 1852 and 1870 was marked primarily by the creation of a network of broad boulevards that cut through the densely packed old city of Paris inherited from the Middle Ages. These avenues were marked by buildings with unified facades. The side walks were lined with cafes , restaurants, and stores. Public parks were also part of this renovation. 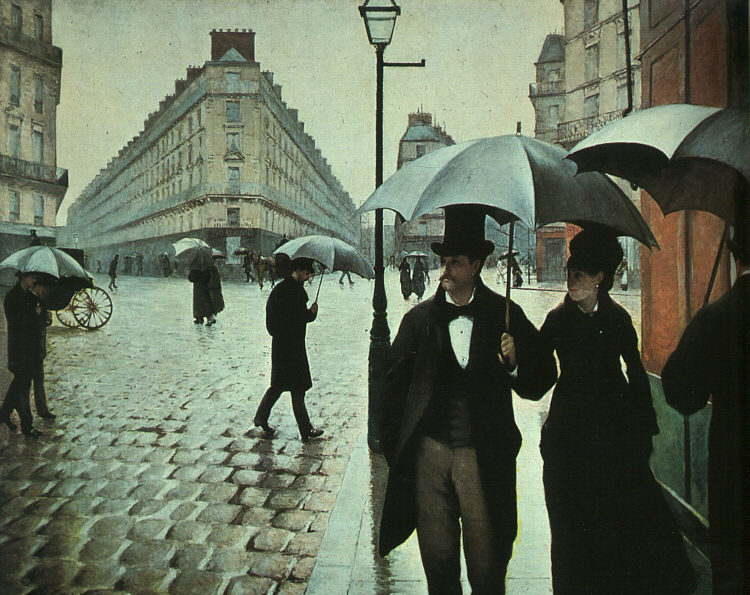 It is this modern city that is the subject of many Impressionist paintings. 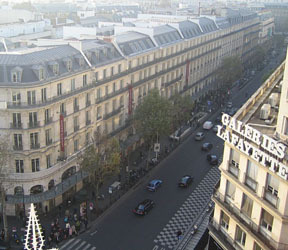 View of the Boulevard Haussmann with the department store, Galeries Lafayette , in the right foreground. 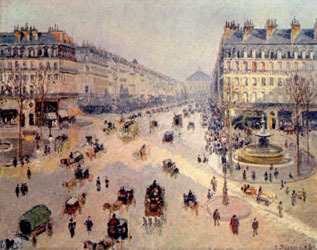 Camille Pisarro, Avenue de l'Opera, 1898. 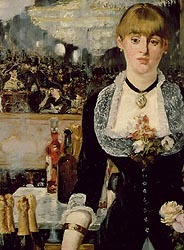 Entertainment was integral to this modern Paris. 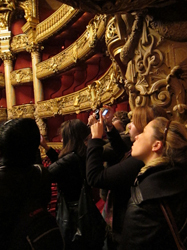 I want to focus our attention on two different venues of entertainment: the Opera and the so-called café chantants. 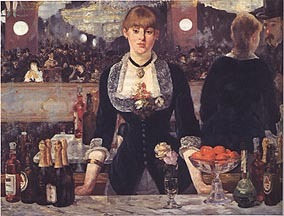 The latter also known as cafés-concerts were centers of popular entertainment. Mixing alcohol and popular and frequently vulgar entertainment, the cafés-concerts or café chantants were places of pleasure and places on the margins of polite society. 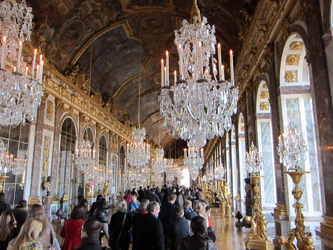 These were not the place for upper class women (haute-bourgeoise). 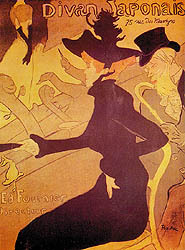 The 1888 Baedeker guide to Paris says at these establishments "the music and singing is never of a high class, while the audience is of a very mixed character...The alluring display of the words entrée libre outside the café chantants is a ruse to attract the public, as each visitor is obliged to order refreshments, which are generally of inferior quality." She danced before the mirror, the orange-rosy lamps. 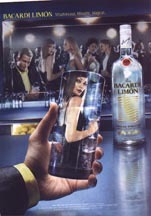 The tall, slim girl; the vague distinction of her grace; her candid blue eyes; her straight profile. She wore a tufted straw bonnet, a black jacket, and a dark blue serge skirt - white bodice opening far down a boyish bosom. 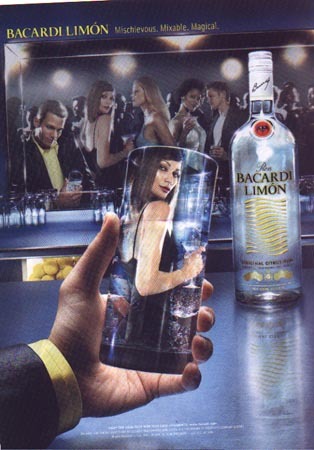 Always arm in arm with another jolly girl who also seized my arm for the invariable reason of giving them drinks. 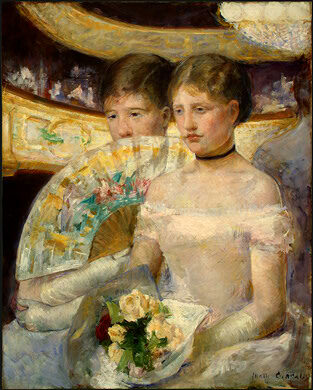 The reflections - herself with the unconscious air, as if no one were looking - studying herself before the mirror. She had a perverse genius, besides which she was always adorable and excitable, morbid and sombre, biting and stinging; a creature of cruel moods, of cruel passions; she had the reputation of being a lesbian; and apart from this and from her fascination, never in my experience of such women have I known anyone who had such an absolute passion for her own beauty. Ah! how women are to be pitied; men are at least free. Absolute independence in everyday life, liberty to come and go, to go out, to dine at an inn or at home, to walk to the Bois or the café; this liberty is half the battle in acquiring talen, and three parts of everyday happiness. How many irritations for the single woman! She can hardly ever go out in the evening; she would be taken for a prostitute. There are thousands of places where only men are to be seen, and if she needs to go there on business, the men are amazed and laugh like fools. For example, if she should fin herself delayed at the other end of Paris and hungry, she will not dare to enter a restaurant. She would constitute an event. She would be a spectacle. 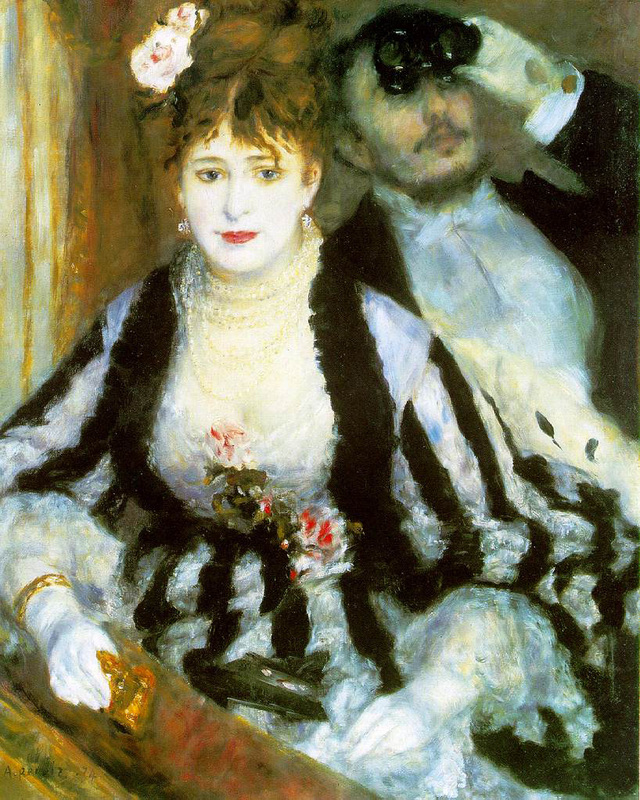 All eyes would be constantly fixed on her and she would overhear uncomplimentary and bold conjectures. 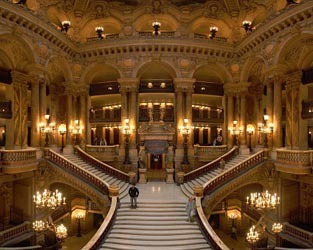 The centerpiece Haussmannisation of Paris was the Opéra. 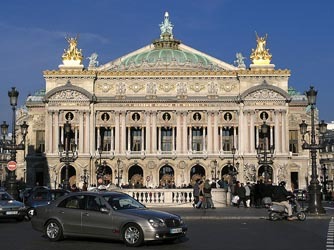 The imposing Neo-Baroque facade dominates the Place de l'Opéra which marks the intersection of a number of the grand boulevards. 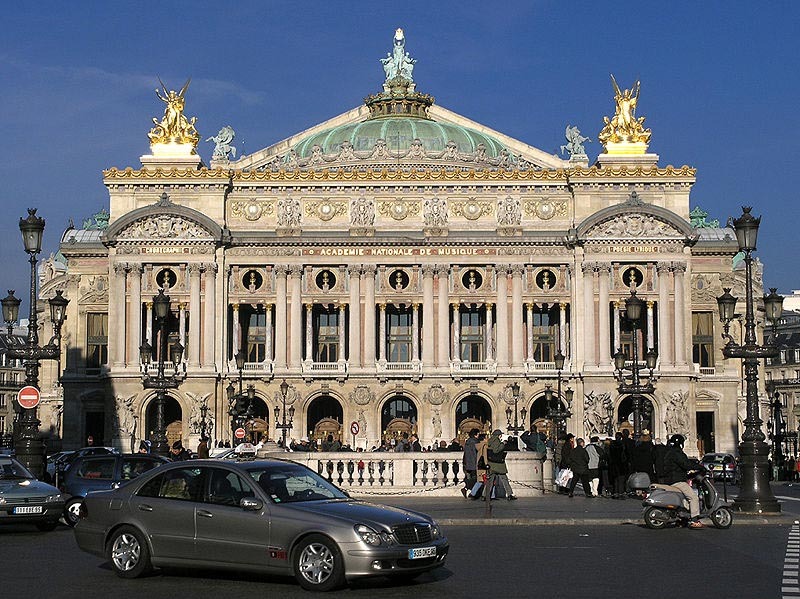 Designed by Charles Garnier, the Opéra was constructed between 1861 and 1875. This was a place designed for spectacle. 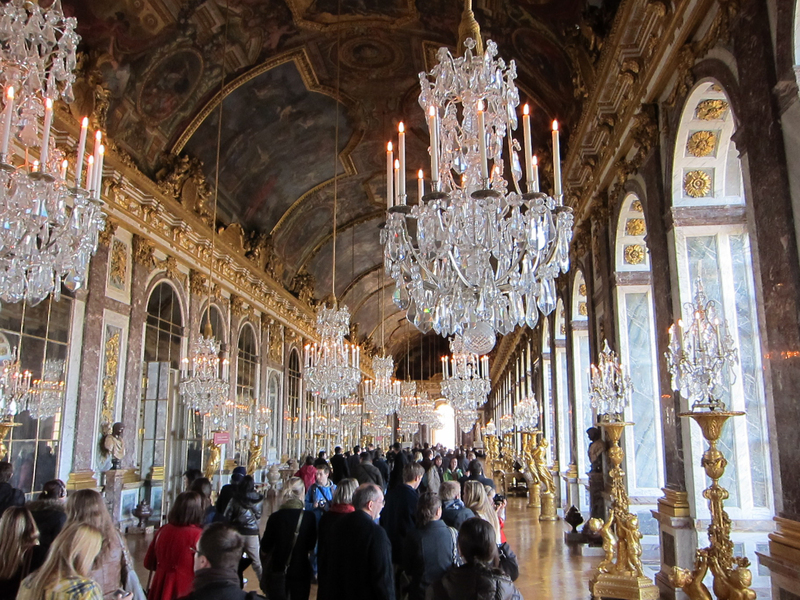 Its lavishness makes it a bourgeois palace. 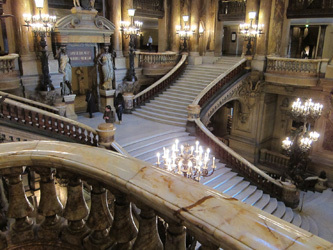 The entrance stairway served as a stage for grand entrances. 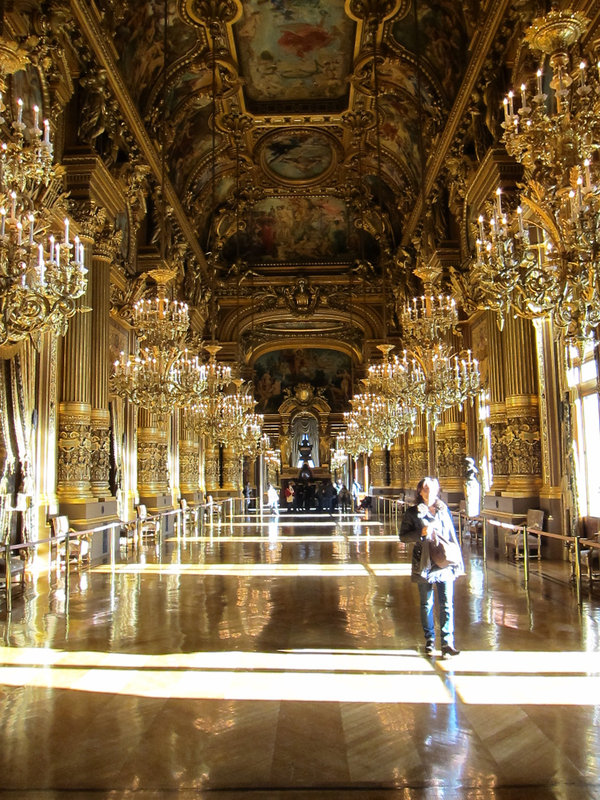 The Grand Hall used for receptions and intermissions rivals the Hall of Mirrors of Versailles in its opulence. 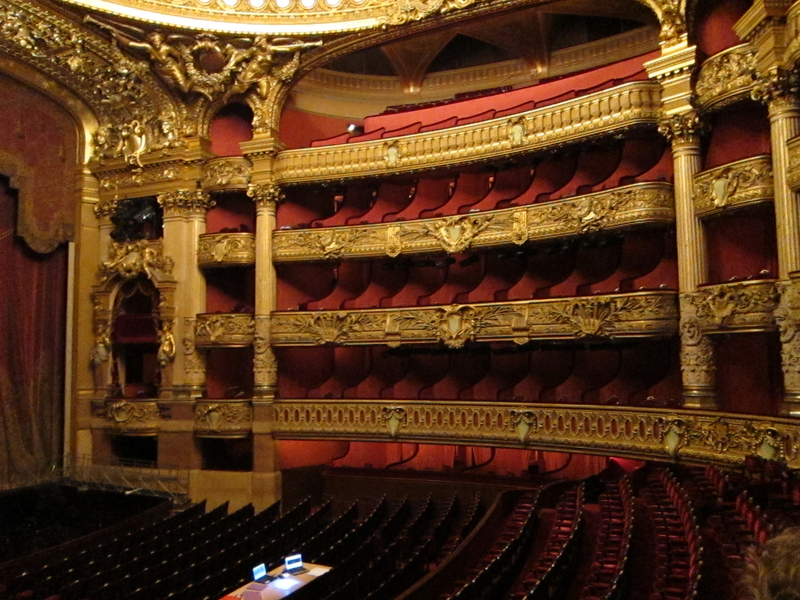 The Opéra was designed as a place to see and be seen. 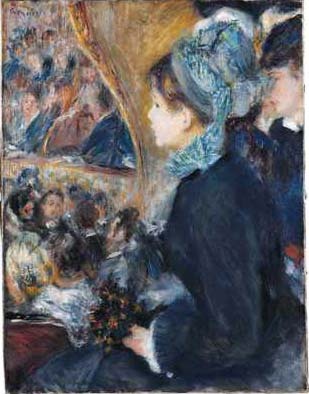 The spectacle was as much in the public places as what appeared on stage. It was also a place where gender and class divisions were played out. 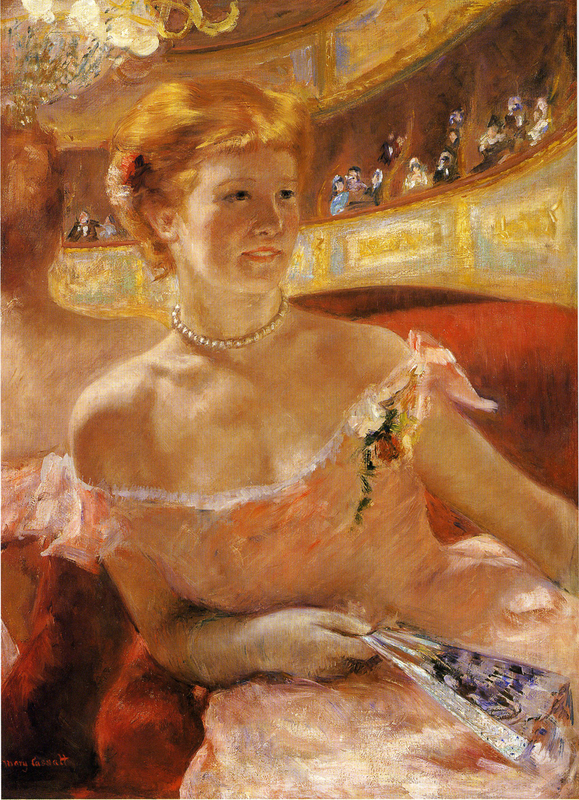 Unlike the cafés-concerts, the opera presented no social stigma for upper class women. 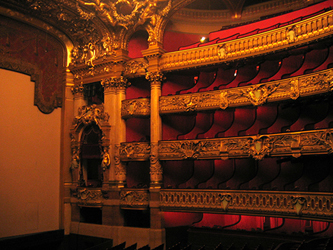 The balconies were segregated by social class with the lower classes in the upper boxes. 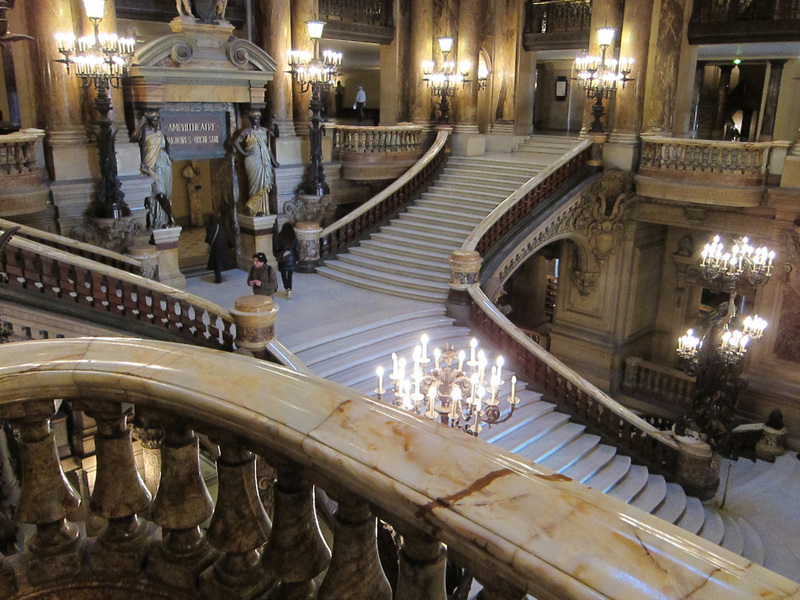 The balconies were also divided into boxes. 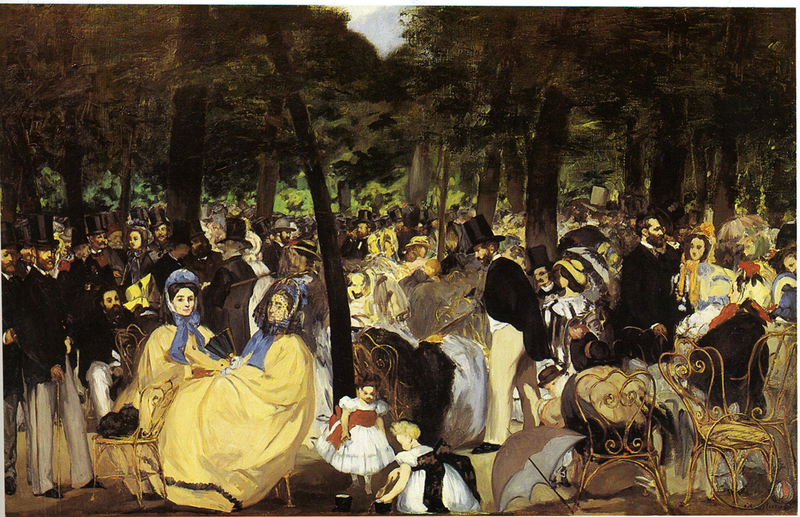 This created a division between public and more private spaces. The undivided orchestra seats were set aside for independent gentlemen while women sat in the boxes. The Opéra was one of the venues in which young women were introduced to society. 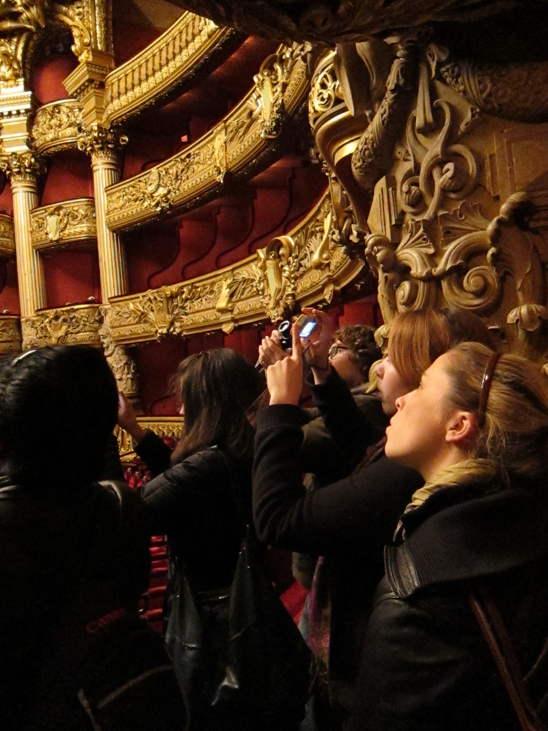 Fathers brought their daughters to the Opéra to be introduced to eligible bachelors. The Grand Hall during intermissions was a time for introductions. Interior of the Paris Opéra (Opéra Garnier). 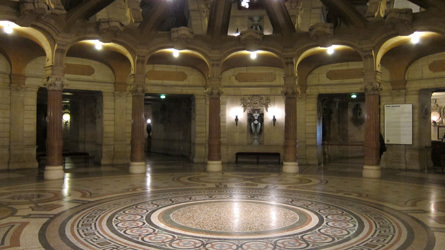 Great hall used for intermissions and receptions. The Opéra as a place of spectacle was a popular subject for Impressionist paintings. 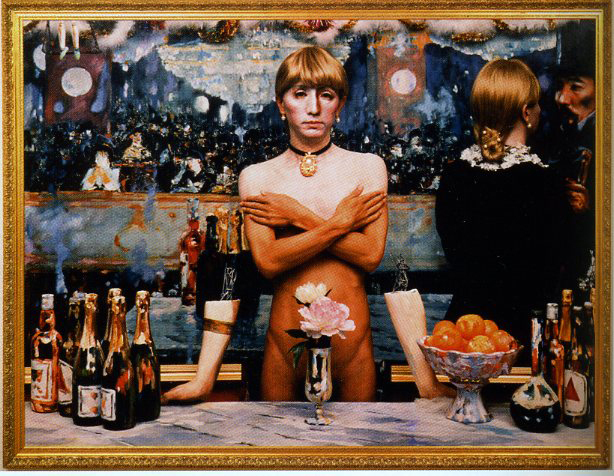 With an awareness of the gender and class divisions that were part of the Opéra as well as our discussion of looking and the gaze last week, I would like you as a journal assignment to compare these paintings. 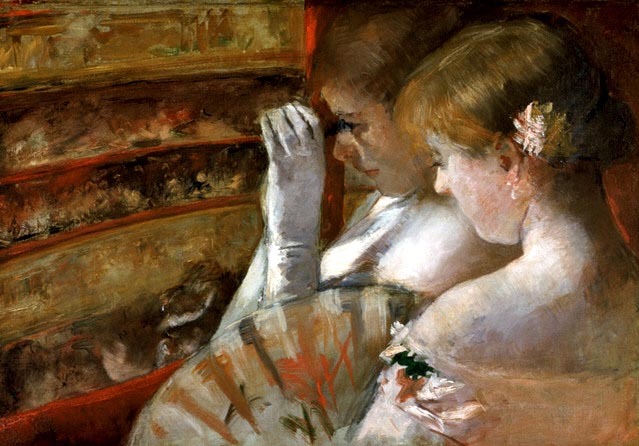 Pay attention to different approaches of the male artist (Renoir) and the female artist (Cassatt). 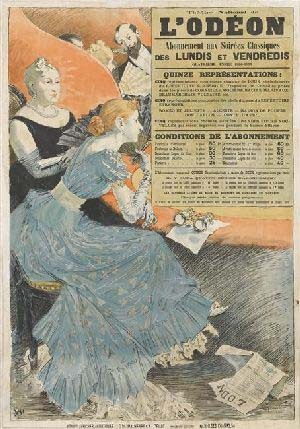 Also see how a contemporary poster employs gender and spectatorship to advertise the Odéon theater. 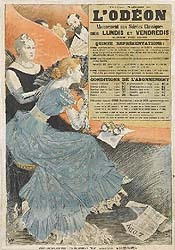 This poster accentuates the point that the spectacle of the audience is almost as much of the draw to a theater like the Odéon as the actual performance. 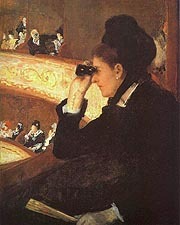 Mary Cassatt, At the Opera (1879). In contrast to the other images, note how Cassatt makes this woman an active looker. In your journal try to explain why. 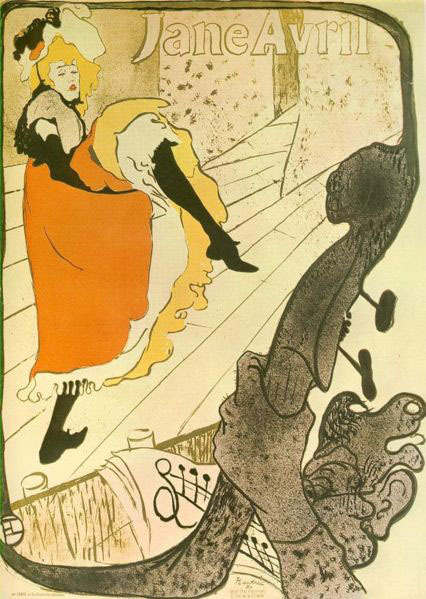 Eugène Grasset poster for the Odéon Theater. 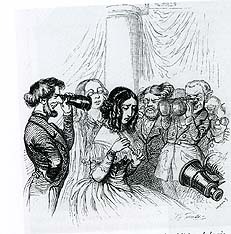 Caricature in Petites Misères de la vie humaine, 1843.